Based on the popular comic book series by Ma Wing Shing (whose work "Wind and Cloud" was also the inspiration for "The Storm Riders"), A Man Called Hero stars Ekin Cheng as Hero, a martial arts master whose family is slaughtered. Hero flees with the sought after sword to the United States, where he attempts to rebuild his life and take revenge. 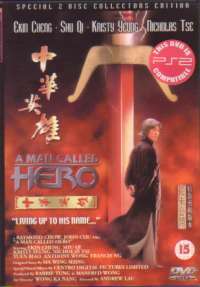 A Man Called Hero is the follow up CG heavy film from the people that brought you The Storm Riders. The Storm Riders broke new grounds as far as Hong Kong films go, as it was the first Hong Kong film to feature special effects on a par with what could come out of Hollywood. With its success, it was inevitable that more films in that mould would follow. However, A Man Called Hero is not generally liked as much as its predecssor. This could be because it is definitely a much slower film, or possibly because the plot is apparently a bit harder to follow, or even because the special effects don't fit as well in this film. While I also like The Storm Riders more than A Man Called Hero, I just watched the latter prior to writing this review, and I have got to say that I still very much enjoyed it. "Yes, I know I'm gorgeous too..."
The plot for the film is reasonably complex, but also quite linear, as there are no twists or turns in the story. The hardest part is keeping up with the time changes, as there are many flash backs/forwards in the film without things like "16 years later" or anything like that as a warning. That aside, I didn't find it to difficult to follow, so I'll try to summarise it as concisely as possible. The film starts with Hero (Ekin Cheng) being accepted as a disciple of Master Pride, but on return home from his trial, he finds his family slaughtered by a group of opium dealing westerners, so promptly takes revenge. With that, he very soon leaves his wife, Jade (the gorgeous Kristy Yang), for America where he becomes a labourer/slave. Things get even worse from him there as he is accused of murdering one of the foreman. While serving his punishment he is rescued, and disappears for a long time. At this time, his wife and best friend, Sheng (Jerry Lamb), arrive in America in search of Hero, as Jade is pregnant, and after searching for him for a long time, they eventually run into each other. "What do you mean this hair colour isn't allowed?" While things start to go well for Hero, some Japanese ninjas arrive in search of Master Pride's disciples, Hero and Shadow, and an encounter with them results in the hotel Hero and Jade were staying being burnt down, while Jade is giving birth. In the rescue attempt, after Jade has given birth to a boy and a girl, Hero's daughter is kidnapped by a corrupt Chinese foreman, and things get even worse here for him. 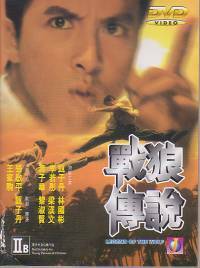 Meanwhile, Invincible (Lawrence Ng), a fellow student of Master Pride's master, challenges Pride to a duel in order to claim the China Secret - the ultimate power in martial arts - but he loses. However, Pride suffered serious internal injuries, and before he died, he passed the China Secret on to Hero. With everyone close to him dying, Hero seeks a fortune teller, and is told news that influenced him for the rest of his life. After that he was not seen for 16 years. "I'm so tough, I don't even have to look at you!" This brings the story up to the present day, which is interspersed with the flash back scenes, so the whole film is told as a story in flashbacks. For what happens next, watch the film! Ok, first and foremost, this is NOT a martial arts film. There are some scenes of action and swordplay, but it is truely of the fantasy sort. So if you are expecting great fights, then you are in the wrong place! While there are only a few action scenes, the rest of the film tells the story at a good enough pace that I found it didn't really bother me. The story was interesting, and it was good to see how the film developed, so the lack of regular action wasn't much of a factor for me. When there was action, though, it was still good to see! There are really only 3 main action scenes in the film, with several smaller ones spread out. The best one though, without a doubt, has to be the, unfortunately rather short, fight between Master Pride and Invincible. The CG on show here really works well, and looks bloody good! It is a battle in the rain where they make the rain drops becomes weapons, and it really has to be seen to be believed. "Meteorologists were baffled by the strange weather phenomenon..."
The last of the three main action scenes is the only other one really worth noting because of the CG used in it. The director and producers were really going for something special for this scene, as it lasts a good length of time, and they set on and around the Statue of Liberty. While it is entertaining to watch, I have to admit that some of the CG effects did look rather ropey, and not that convincing. Which was a shame. Performance wise, I thought all the characters were good in their roles. Ekin Cheng's deadpan delivery was quite suiting for Hero, given all the tragedy which befalls him. Kristy Yang was damn gorgeous and happy looking, and Jerry Lamb did a very good job as Hero's loyal friend, and despite not really being a primary character I still thought he acted the best out of them all. As you can see from the cast list above, there are a lot of famous names in this film. Characters do seem to come and go quite frequently, but it is not that difficult to keep track of at all. "Quickly! Pose for the camera!" The film isn't all good though. In the plot I certainly have a few complaints. Firstly, while the main story is quite easy to follow, some of the other events which go on during it, remain unresolved and unquestioned by the end of the film. For example, what happened to Hero's daughter? You never find out. Hero's revenge on the Japanese ninjas? It never happens. Again it is a pity these questions are never addressed as it would have made the film a bit more concise and solid, rather than having all these loose ends lying about. Granted all the unquestioned events were seen through to their conclusion it would probably have tied everything up too nicely, but if they had at least been addressed and maybe left with a little mystery it would have been far better. That being said, I have read that every release of A Man Called Hero that is currently available from any country, is cut. By how much I don't know, but from what I gather, there was a full length version, and then this version which was the general version released on video and DVD. If it is anything like The Storm Riders where the full length version is about 130 minutes long, but the "International Version" is cut by a whopping 40 minutes down to 90 minutes in length, then it is possibly no wonder that there are so many loose ends in A Man Called Hero. I do hope that someday soon, the full length version is made available, so that I can see how it changes the film. "Yes, I think that is close enough." On the whole though, A Man Called Hero was an enjoyable film, with some truely spectacular CG effects, and a good enough story to keep me interested throughout. 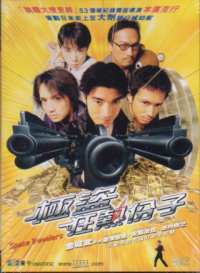 The film comes in two versions, full screen with english dialogue, or widescreen with Cantonese dialogue and english subs. I watched the latter, as I have no interest in the former. The sound throughout was pretty good. It comes in DD5.1, and the surrounds are used well throughout. Ambient effects, like rain, are spread around all the speakers, and distinct sounds, like background voices, door knocks and things travelling from on screen to behind you, all utilise discreet speakers well. I was very happy with it all. The dialogue at times was a little too quiet, as I had to turn up the volume on a couple of occassions, only then to have to turn it down quickly when something like an explosion happened! This quibble aside, I was happy with the audio. "I didn't touch it! Honest!" The subs were good and bad. Good because the grammar throughout appeared to be perfect, except for I think one occassion, and the spelling was also perfect throughout. However, they are bad for these reasons. They are positioned off the film print in the black bar below the print. The film is letterboxed so anyone with a widescreen TV would have to zoom the image to make it fit their whole screen. Unfortunately because of the positioning of the subs if you do this you will not be able to read any of them as they will be off the bottom of the screen. So people with widescreen TVs will have to watch it in letterboxed 4:3 mode. The text and voice at the very beginning of the film are not subtitled. I don't know how significant this is to the plot, but it is really quite infuriating having this text appear on screen, and a voice I guess reading it, but not having the subtitles. There are also a couple of other occassions when text is unsubtitled on screen, but I don't think the text in those occassions was that important. There is also one instant where a line of the subtitles blinks on screen translating the current conversation. And I do literally mean "blinks". I tried to pause the dvd when they appeared so I could read them, but they are there for such a short period of time that I couldn't manage it. Despite only being letterboxed and not anamorphic, the print still looked pretty good. There were no noticable digital effects appearing on screen, and the detail level looked reasonably high. On the whole I was impressed, just a shame that it wasn't anamorphic. "More typical Glasgow weather then..."
Extensive biographies and Filmographies of cast and filmaker. Not really that much there to be honest, but the highlight and really the only one worth anything, except if you like music videos of the main song from the film, is the Making Of. This has interviews with the cast, and is subtitled in english, and also shows in great detail how they went about doing a lot of the CG effects. The level of detail and research that went into making the Rain Fight as good as possible will probably have completely passed you buy when you watched the film. But seeing this Making Of you realise that A LOT of time and effort went in to it. They tried to recreate as accurately as possible the way light would be reflected through each rain drop, so that the backgroud behind as seen through the drop, would be as accurate as possible with water refraction taken into account. Very enlightening, and it makes you appreciate the effects all the more! This featurette is a very worthwhile watch. The rest didn't really interest me that much, and is nothing special. "Aaaargghhh! You're standing on my foot!" While some look down on A Man Called Hero as being the weakest of the first three CG action/wuxia films, the third being The Duel, I have to disagree. In this genre from Andrew Lau I have to admit that each successive film they did got worse each time. They started off with the classic The Storm Riders, which is excellent in my opinion, and then came this film, which is also very good, but from there on it just didn't work. The Duel didn't do it for me at all, and the most recent The Avenging Fist, they went too far overboard, and it was all flash and nothing of substance. A Man Called Hero may still be slower paced than the others, but it does tell an interesting story, and is definitely worth a watch. Now if only someone would release a fully uncut version! "Well I think it brings out my eyes. Ok?"